CUSTOM DESIGNED HOME! 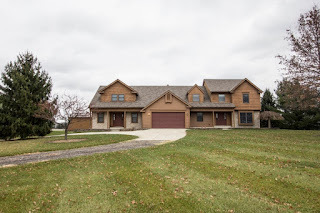 Located on 5 beautiful acres, across from The Horse Park, with woods and tree lines! Over 5,500SF on 3 finished levels! Built with the Blended/extended Family in mind. Italian marble floors and newer carpet. 2 complete Master suites (both with whirlpool tubs). 2 complete and fully applianced Kitchens. Sunken Great Room has vaulted ceilings and floor-to-ceiling stone fireplace. 2nd Floor Den/Bonus Room. 1st floor guest suite with vaulted ceilings and private full bath access (possible 1st floor Master). 2 basements, both partially finished. Oversized 2 car attached garage plus a Barn/4+ car detached garage. 5 BRs & 4.5 Baths. Big Walnut schools. Only $597,700! Call DeLena today!